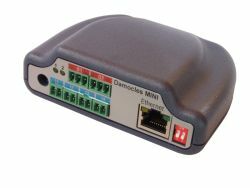 Damocles MINI is ethernet state sensor/relay with 4 digital inputs and two configurable Normal Open / Normal Close relay by HWg. Applications include - System Integration, Remote Low Voltage Power management, Automation, Enhance products with a remote power control, Digital Signage, Lighting control, Climate Control, Power Scheduler, Security and many more. 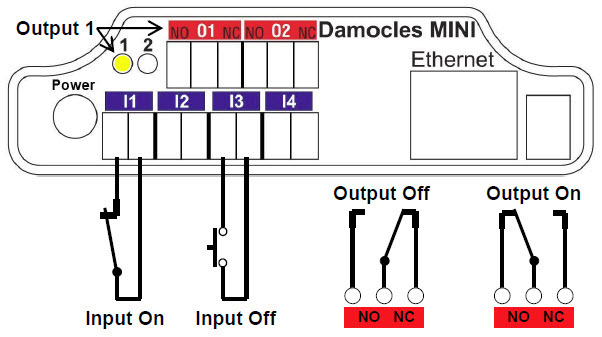 When integrated with iMCA System, you can not only remotely control 2 Normal Open or Normal Closed relays and attached devices from virtually anywhere, but also create virtual connections with any sensors registered in the iMCA System such as temperature, humidity, vibration, flood, air flow, PIR detectors, GAS detectors, etc. You can easily create and execute any number of automation scenarios based on time schedule or sensor information, without having to deal with any cryptic codes or learning a scripting language. Ideal for small to medium size projects where remote power control required. When used with the iMCA System and its state sensors (including this unit itself) it is useful for quick visual monitoring of states of various objects like doors/windows open/closed etc.